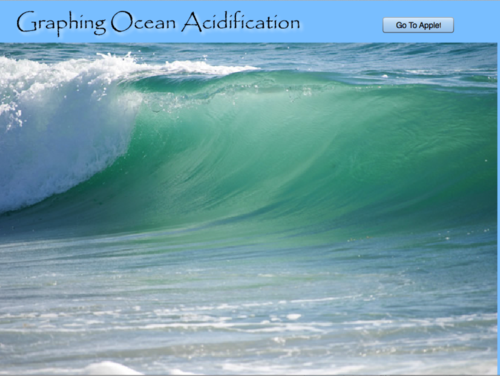 Excellent ocean acidification graphing tool to use in an oceanography/marine biology class. Requires additional information about context, relevance to climate change, and interpretation of data. Viewing the visualization in its lesson context [link http://www.explainingclimatechange.ca/Climate%20Change/Lessons/Lesson%20... would be useful to the educator before using the tool with students. The app might best be used in the context of additional information and interpretation. Visualization is a graphing tool for plotting changes in atmospheric C02 against pH from 1988 to 2009. Data used is adapted from published data, but how it is adapted is not specified. Visualization is presented with very little background information or context. Data is drawn from one location north of Hawaii; however, the same trends have been observed in other locations around the world. Easy to click the buttons to plot the data and draw a trend line.